In this blog post, ILRI agro-economist Jo Cadilhon reflects on a recent conference in Kampala, Uganda that brought together agricultural and livestock value chain researchers and practitioners. The participatory approach of the conference fostered exchange of information and helped the participants learn from each other's experiences. Plenary storytelling at the agrifood chain toolkit conference on livestock and fish value chains in East Africa held at Kampala, Uganda on 9-11 September 2013 (photo credit: ILRI/Megapix). 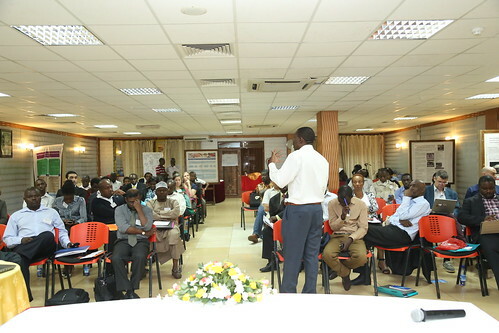 The International Livestock Research Institute (ILRI) organized the first Agrifood Chain Toolkit Conference in Kampala from 9 to 11 September 2013. The objective of the meeting was to gather researchers of value chains and practitioners developing value chains in the field so as to foster feedback from the practitioners on the analysis tools developed by researchers. The meeting also meant to raise the awareness of practitioners on analytical tools available that could help solve their problems of value chain field development. This whole initiative was undertaken to contribute to the Value Chain Clearinghouse activity of the CGIAR Research Program on Policies, Institutions and Markets. This first conference was focused on livestock and fish chains so as to tap on ILRI’s expertise and partners within the CGIAR Research Program on Livestock and Fish. As one of the organizers of the event, I would like to reflect on it with the viewpoint of a value chain researcher. I also reflected on the lessons I learned from the conference with a livestock and fish value chain developer’s viewpoint. Short videos are also available showcasing the reflections of the conference participants and of the organizers. The concept of an Agrifood Chain Toolkit Conference is built around 'No PowerPoint'. This is meant to foster interaction between participants. This can seem a bit off-putting for researchers who are used to presenting their work under this widespread format. However, as the editor of the conference coordinating the review of contributions submitted, I was very clear that contributors had to find an alternative way of presenting their work. Many researchers opted for posters instead. Our ILRI facilitator Ewen Le Borgne made a wonderful job of getting everybody involved into discussions through a series of various activities. After the usual icebreaker to let all 58 participants have an idea of who else was in the room, we heard two stories in plenary. The first was told by a value chain practitioner on the problems he had faced developing dairy value chains in Zimbabwe. The second was beamed live from Nairobi with my colleague Hikuepi (Epi) Katjiuongua telling us about the development and adaptation of the Livestock and Fish Value Chain Toolkit. We then gave the opportunity to value chain researchers in the room to present their tools and methods for value chain analysis to the rest of the participants through a mini-sharefair. All presenters had a corner in the room where they could present and discuss their work with other participants who would roam through the room according to their interest. This part of the meeting did not work quite well. Perhaps because the main interest of the participants at that time of the day was to enjoy morning tea and snacks. Those were served outside the conference room despite our specification to the venue staff to serve those within the room. Understandably, some of the researchers felt a bit frustrated to see their work was attracting less interest than tea and snacks. The rest of the first day was used to learn from the experiences of value chain practitioners: their stories allowed the researchers to get a better grasp of the problems they were facing to develop value chains in the field. On the second day, all participants divided into five small groups to go visit five different value chains: two pig value chains, two dairy value chains and one farmed fish value chain. This allowed value chain researchers to get an even closer understanding of the problems faced by value chain practitioners. It was also an opportunity to undertake quick-field testing of some of the questionnaire tools ILRI had developed in its Livestock and Fish Value Chain Toolkit. On the third and final day of the conference, the researchers were now better aware of all the different problems faced by value chain practitioners who were also participating in the conference. So Ewen and I gave the researchers another chance to market their value chain analysis tools and methods knowing the types of issues that had been discussed on the first day and the real-life problems encountered during the field visits. A second iteration of the mini-sharefair on value chain tools and methods followed. This one was a greater success because the researchers had been able to customize their marketing pitch to attract visitors to their display using the language and keywords that they had heard being used by the value chain practitioners, and by mentioning that their methods and tools could actually contribute to solving some of the real-life problems they had heard and seen during the past two days. The interactions between researchers and practitioners were then very lively with several practitioners coming one after the other to see researchers who had tools that could help solve their problems. There were many expressions of interest to use some of these tools in new contexts through research-for-development projects still to be constructed. Most fulfilling, I heard many value chain practitioners saying they could use some of the tools themselves if those were made available to them and would report back on how they were used and the difficulties faced to adapt them to their own context. This strong interaction and feedback process between value chain researchers and value chain practitioners was exactly what the Agrifood Chain Toolkit Conference was meant to foster. More such conferences will follow focusing on other commodities in other regions. To stay informed about future events, register to the Agrifood chain toolkit online discussion group. Better lives through livestock. ILRI is a member of the CGIAR Consortium. Links to external websites are correct at the time of posting but due to the fact that web pages are constantly changing, long-term accuracy of these web links cannot be guaranteed. Linking to external websites does not mean endorsement of the same and ILRI does not claim responsibility for the content of external websites.